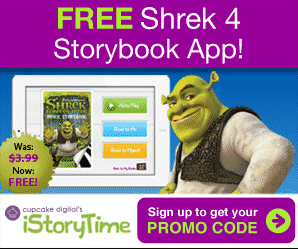 You can download a FREE Shrek 4 Themed Storybook App courtesy of Cupcake Digital. The iStoryTime library app includes a selection of narrated children’s storybooks. These book selections include material from your kid’s favorite films, TV shows, and classic stories. The app even helps with your child’s literary skills and reading comprehension with the highlighted text and reading comprehension features. Your child will absolutely love this app. Normally, this app costs $3.99. Make sure you sign up for the free download promo code today!